Simple computations can be performed using the interactions between single-stranded molecules of DNA. These interactions are typically toehold-mediated strand displacement reactions in a well-mixed solution. We demonstrate that a DNA circuit with tethered reactants is a distributed system and show how it can be described as a stochastic Petri net. The system can be verified by mapping the Petri net onto a continuous time Markov chain, which can also be used to find an optimal design for the circuit. 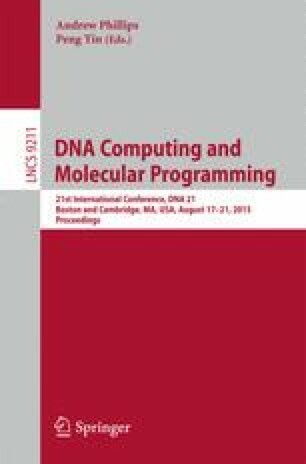 This theoretical machinery can be applied to create software that automatically designs a DNA circuit, linking an abstract propositional formula to a physical DNA computation system that is capable of evaluating it. The authors would like to thank Andrew Phillips (Microsoft Research Cambridge), Marta Kwiatkowska (Oxford Computer Science), Alex Lucas (Oxford Physics), and Jonathan Bath (Oxford Physics) for guidance and helpful conversations.